EZ Stains Blending System: Includes 9 inter-mixing stain bases allowing you to create 100's of colors in minutes. EZ Stains Blending System: Gives you the ability to independently produce precise batch-to-batch color consistency. EZ Stains can be clear coated with all types of coating including lacquers, vinyl sealer, pre-catalyzed lacquer, conversion varnish; including all solvent-based, oil-based and water-based products. EZ Stains Blending System: You have the ability to create small batches of custom stains within minutes, on-site, and at a significantly lower cost. Formulated to be recoated immediately after wiping. EZ Stains use high-end finely ground industrial grade pigments and dye concentrates allowing for excellent clarity, and distinct grain definition; it also helps to eliminate hard settling. Apply dyes directly to wood surfaces or mix with 9 classic blend stains to create dark, rich looking colors. Dyes are also compatible with most lacquers and varnishes to create your own shader coat. The look of old world craftsmanship created with the latest colorant technology. Select a color; our Formula Book provides 80 precise color formulations that allow you to match stains by weight or volume. EZ Stains is a blending system designed to be used by professionals only. Your end result is a quality finish highlighting the natural beauty of the wood. 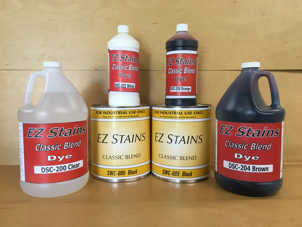 EZ Stains Blending System allows you to create your own custom colors using the 9 Classic Blend Stain Bases and 1 Clear base. (6 Dyes are also available). You'll produce batch-to-batch consistency in pints, quarts, and single or multiple gallons. Electronic Timer automatically controls the mixing time of your EZ Stains colors from between 1 and 15 minutes. Mixing Lid One Gallon & Quart Mixing Lids are used for easy pouring. The lid has a Teflon seal and four snap clamps which holds it securely to the container and prevents leaks. Floor Scale used to measure out larger quantities of stain batches. Bench Scale used to measure out pints, quarts, and gallons. allowing for excellent clarity and distinct grain definition; it also helps to eliminate hard settling.